Shortly after I became a Christian in September 2004 the Lord started putting in my heart the thought of teaching His word as a change of occupation. Ever since, Iʼve felt the need to share with others the treasures He shows me in His word. Around August 2005 I went to a missions trip in Austria to minister to missionaries at a conference for missionaries. While there I sensed the call to join that group of people that I was serving—missionaries. In January 2006 the Lord gave me a verse (Mar 5:19) in a pastors/leaders conference where I felt His calling to serve His people among the Hispanics of the world. After that came a time of validation of calling with the leaders of my home church and preparation that lasted several years. 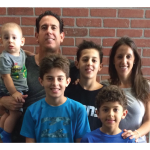 Finally in March 2010 I was sent with my wife and my three kids to assume the leadership of a small congregation in the city of Lima-Peru as their senior pastor. Myself and my family served that congregation for six-and-a half years where I developed an Internet teaching ministry through Facebook. Through that ministry we promoted my weekly Bible teachings throughout the Hispanic world. Today that ministry has 37,000 likes and reaches over 80,000 people throughout the Hispanic world. In August 2016 we left Peru and came back to the US with the calling to continue to serve the Hispanics of the world, but from the US. The vision is to continue to serve the Hispanics, both locally through our home church and internationally through the Internet ministry on Facebook.